Is It Time to Buy Financial Select Sector SPDR Fund (XLF)? Banks are making excellent profits. Is now the time to get into the sector? The best way to invest without the guesswork of picking individual stocks is through exchange-traded funds (ETFs). If you'd like to invest in the broad financial sector, the largest and most popular option is the Financial Select Sector SPDR Fund (NYSEMKT:XLF). Now that earnings season is wrapping up and most banks have posted solid results, perhaps now is the time to buy, as valuations are still low and the lingering effects of the financial crisis are still being sorted out. The Financial Select Sector SPDR has about $17.3 billion in assets and aims to achieve results that reflect the performance of the Financial Select Sector Index, which includes bank stocks as well as REITs, insurance companies, and other financial institutions. Top holdings of the fund include Berkshire Hathaway (8.7% of assets), Wells Fargo (8.6%), JPMorgan Chase (7.7%), Bank of America (5.8%), and Citigroup (5.3%). No other companies make up more than 3% of the funds' holdings. One of the most attractive aspects of the fund is its extremely low expense ratio of just 0.16%. There are almost 40 other financials ETFs to choose from, but they don't match the cost and performance of the SPDR fund. The next-largest ETFs that track the overall financial sector are the Vanguard Financials Index Fund (NYSEMKT:VFH) and the iShares U.S. Financials ETF (NYSEMKT:IYF), which both have higher expense ratios of 0.19% and 0.46%, respectively, and have failed to match the returns of the SPDR fund. During the most recent quarter, the banking industry produced $40.2 billion in net income, marking the second-most profitable quarter for the industry in history. Deposits are up across the board, consumer lending is extremely strong, and investment banking is doing well thanks to high merger and acquisition and IPO activity. And banks are beginning to run more efficiently by embracing mobile and online technologies in order to reduce their physical footprints and cut expenses. Many financial institutions are still very cheap on a historical basis. One of the best measurements of a bank's valuation is its stock price relative to its tangible book value, which is the sum of all of the company's tangible assets. As you can see in the chart below, all of the "big four" banks are trading at historically low price-to-tangible-book levels, and one of them (Citigroup) is actually trading at a discount to its tangible assets. 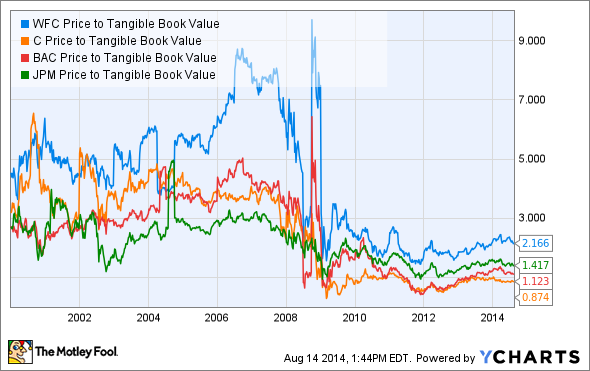 Even rock-solid Wells Fargo is trading for about half of its historical average valuation. Despite the depressed valuations, the banks have improved a great deal. While companies like Wells Fargo and Berkshire Hathaway were always pretty strong, this wasn't the case for much of the rest of the sector. For example, Citigroup has done a great job of winding down its Citi Holdings "legacy" assets that are left over from the financial crisis. And while the $111 billion in assets still on the balance sheet remains high (and is one of the main reasons the stock's valuation is so low), the company will keep shedding the assets until that figure makes up a negligible part of the balance sheet. Citi Holdings Assets 2011-2014 | Create Infographics. And banks are much better capitalized than they have been, and they keep improving. The Basel III Tier 1 Common Ratio has improved among all of the big banks in recent years. Regulators use this ratio to determine a bank's health, and a ratio of 6% or higher earns the highest classification of "well-capitalized." Due to the lingering effects of the financial crisis, banks (which make up most of the Financial Select Sector Index) are still cheap, but they won't be forever. At some point, the mortgage-related lawsuits will be over and done with, the toxic assets will be worked off the balance sheets, and the banks will command a loftier valuation for the profits they earn. And while you'll be able to capture the upside as the "cheap" companies like Citigroup and Bank of America excel, you'll also have the safety of companies like Wells Fargo and Berkshire Hathaway, which should produce great returns in the meantime. It looks like a great time to get into this still-rebounding sector, which won't be on sale forever.